When Christmas trees were still a new custom, inventive methods of decorating trees with as much light as possible were developed. Actual lights, from candles to electric bulbs, were used, of course; but, to magnify the sparkle and fascinate the young, metallic tinsel and glass baubles became accessories for the well-dressed Christmas tree. Glass ornaments were a European invention and cottage industry from the rise in popularity of the Christmas tree in the mid-1800s to World War II. When European supplies were extinguished by the war, the manufacture of glass ornaments became a mass production industry in the United States. More recently, exclusive designers have created a demand for highly imaginative and colorfully decorated ornaments. Wreaths and garlands made of herbs and evergreens have been part of celebrations for thousands of years. Winter festivals in particular featured fragrant evergreens that symbolized everlasting life. From the Hebrews, Greeks, Romans, and Druids, early Christians borrowed the symbolism of holly, mistletoe, boxwood, rosemary, laurel, and the Christmas tree. In Europe, live trees were planted in tubs and brought in-doors to inspire the residents. Indoor—and unornamented—Christmas trees were documented in Europe as early as 1521. Christmas trees were becoming widely popular in Europe by about 1755, and, also about this time, they were customarily decorated with candies, fruit, gilt nuts, dolls and other toys, and Christian symbols including figures of the Christ Child. Queen Victoria's consort, Prince Albert, is generally credited with importing the Christmas tree custom from his native Germany in 1841. German immigrants, including Hessian soldiers, carried the heritage of the Christmas tree to America. Christmas markets in European towns and villages sold gold leaf for gilding fruits and nuts, dried fruits such as figs and prunes, strings of glass beads, tissue paper, all kinds of small toys from hobby horses to drums and soldiers, and tiny cakes and sparkling marzipan confections specifically for decorating the Christmas tree. Miniature candles were also made just for trees, and metal clips were made to hold the candles on the branches and collect the hot wax drips. The annual Christmas markets demonstrated the growing demand for tree ornaments, and families sought heirlooms that could be passed to succeeding generations. In Victorian times, and in both Europe and the United States, Christmas lights made of glass began to replace the dangerous candles. These lights were tiny lamps made of pieces of colored glass and hung with loops of wire. Each lamp contained a wick and oil that floated on water. Some lights were hand-blown glass, and others made of patterned glass were popular because they reflected sparkling light. Glass ornaments replaced mostly edible decorations on trees in about 1850-1860. A "cottage industry" blossomed in the Thuringian mountains of Central Germany, where peasant families manufactured hand-blown glass ornaments. Glass-making was a tradition in the town of Lauscha, for example, that turned its manufactures to ornaments in the 1860s. In a typical glass-making family, the father and adult men blew glass tubing that was heated over a Bunsen burner into ornament shapes. The other family members applied a silver nitrate solution to the insides of the ornaments, so they would reflect light. Boards with rows of nails in them were hung from the cottage ceiling, and the coated ornaments (with stems of glass tubing still attached) were inverted over the nails and dried over night. Each ornament was then dipped in brightly colored lacquer and decorated with paint or fancy attachments like ribbon, spun glass, or feathers. The glass stem was cut, and a metal hanger was attached. Balls and ovals certainly predominated, but, by making plaster or metal molds into which the glass was blown, many fanciful shapes were devised. Hunting horns, smokers' pipes, elaborate bells, delicate vases, and birds with tails made out of spun glass were especially cherished. The colors of these early ornaments imitated those of the colored sugars used to decorate confectionery that had ornamented trees of previous generations. Entrepreneurs, like Frank W. Woolworth, and shop owners who reached customers well beyond their storefronts via catalogs helped spread the sparkle of glass ornaments in the United States. Germany was the exclusive producer of glass ornaments until 1925. German ornaments first came to America as prized parts of the heritage of immigrants. Later, the ornaments were imported. In 1925, Japan was the next country to produce significant quantities of ornaments; the cottage industry also suited Japanese families. Czechoslovakia and Poland, both countries with strong glass-making traditions, entered the marketplace in the late 1920s. By 1935, the United States imported over 250 million handmade ornaments but still had no industry of its own. In 1939, the commencement of World War II in Europe shut off supplies of glass ornaments among many other European imports. Corning Glass Works in New York entered the ornament business. Corning was skilled in the production of light bulbs, which used a ribbon machine to flow molten glass through an endless series of molds. The machine had been developed in 1926, and, by adapting it to the glass shapes needed for ornaments, Corning could produce over 2,000 ornament balls a minute; and about 100 million ornaments per production year could be generated by ribbon machines at the Corning Works. Today, ornaments are mass-produced by this same method or made by hand with blown glass and specially designed molds as they have been made for over 100 years. Raw materials for ornaments are the same whether they are hand- or machine-made. Glass, in bulk form for ribbon machine manufacture, or in slender tubes in a range of gauges or sizes for blowing is the basic material. The inner reflective coating is called silvering solution; its chemical makeup varies among manufacturers and, in modern production, is proprietary. Lacquers, paints, frosting powders, glitter, and a wide variety of attachments made of other materials (fabric, ribbon, silk flowers, glass beads, etc.) are used to decorate the shapes. Metal catches are punched out of tin or aluminum by specialty manufacturers, as are metal hooks that are mounted inside the catches. Mass-produced ornaments tend to be more standard in shape than the ornaments produced by exclusive designers. Balls and ovals are the most common mass-produced designs; but tree-toppers, tree shapes, bells, teardrops, stars, and icicles are among the common shapes that can be molded and finished on a large scale. For the artists who produce collectible designs, their ornament shapes, sizes, and colors are as limitless as their imaginations. World-renowned designer Larry Fraga of Dresden Dove declares that the only requirement for designing ornaments is "to be a kid at heart." His bubble gum colors and humorous designs have vaulted him into the upper echelon of ornament artists who are hired to produce exclusive ornaments for major department stores, to appear at signing events, and to handpaint limited editions that command top dollar in an $800-million-per-year industry. In the factory, bulk quantities of glass are melted and flowed in a ribbon over a series of molds. 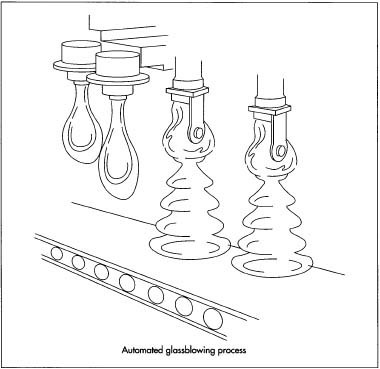 Diagram of a typical automated glassblowing process. As each mold moves into position in front of the stream of glass, compressed air is blown into the mold to force the glass to uniformly take the shape of the mold. Clear glass is used, and sizes range from about 1.75-5 in (4.4-13cm) in diameter. The ornaments move by conveyor to stations where they coated on the inside with silvering solution to provide the mirror-like reflective properties that will show through the exterior coatings. Then, they are coated on the outside by dipping them into a white undercoat or base coat. After the undercoat dries, the balls are transported by conveyor to the paint station where they are dipped in lacquer. Red and blue are the most common colors. Decorations may be added by machine or by hand and may include painted designs, frosting, glitter, or glued-on decorations. Glass manufacturers can also produce spun glass or fiberglass to decorate the ornaments. Plain ornaments are also made for those who like to decorate their own ornaments at home. Metal catches and hooks are prefabricated to the standard sizes of the ornament tops and are attached by machine after the ornaments are decorated; they are made of lightweight metal like aluminum or tin so they are not too heavy for the ornament. The finished bulbs are then transferred to packing stations where specially designed packing materials are used to cushion and display the ornaments for sale. The modern glass blower begins production of a handmade ornament with tubes of glass manufactured by suppliers. The craftsman can melt or cut the tubes into the desired quantity of glass needed for a specific ornament. By spinning the tube over a gas-powered torch, a portion of the glass is softened and kept at a relatively uniform temperature. When the glass is ready to be molded, the operator depresses a foot pedal that opens the mold. The molds can be made of plaster, cast iron, graphite, or porcelain. They can have conventional or highly detailed shapes etched into the molds by laser beams. The soft glass is inserted in the mold as the blower puffs on the glassblowing pipe to expand the glass to fit the mold; the glass-worker has three seconds to complete this process because, as soon as the glass touches the mold, it cools and forms. The finished object has all the detail of the mold and is called a hard casting. It also still has a length of tubing called a stem attached to the top, like a rigid puppet on a stick. Mass-producers of ornaments claim that hand blown ornaments have an inherent disadvantage in that the thickness of the glass may not be uniform, making it subject to breakage. In fact, the skilled artists in Germany have so perfected the combination of glass and glassblowing skills that handmade ornaments may be more durable. Bulk quantities of glass are melted and flowed in a ribbon over a series of molds. In the next step, silvering solution is injected down the stem and swirled to coat the inside of the ornament; the silvering solution can be omitted to produce a translucent ornament that only takes the color of the outer paint and has less of a reflective quality. The silvered hard casting is dipped in white undercoat and allowed to dry. Designer ornaments use a palette of colors and details to achieve their uniqueness. The paints used for ornaments are slow drying and tend to run together, so the ornaments must be painted in a hop-scotch fashion leaving adjacent areas untouched until the painted areas are dry. The artist then paints the alternating areas later. Decorations including glitter and ballo, a glitter-like substance that resembles fine sugar crystals, are applied after paints have dried. An ordinary glass cutter is then used to cut the stem from the ornament, and the metal cap or catch is snapped in place on the remaining stub. Tags and special packaging to identify and protect the individual ornament are added before shipping. Quality control at the ornament factory is ensured by inspections and testing at various stages of manufacture. Several instruments monitor the operation of the ribbon glass machine, providing uniform temperature and viscosity (flow) of the molten glass. After the ornaments are molded, some are selected for testing in a compression machine to verify that the walls of the ornaments are uniform and less subject to breakage. Quality in the application of coatings and decorations is also checked by random inspection. For handmade ornaments, quality control is in the hands of the designer who commissioned production of the ornaments. The glassblowers and crafts persons who handle the ornaments during the process are paid on a piece-part basis, so quantity tends to be more important to the workers than quality. If significant quantities of the ornaments are returned, however, the factory operator stands to lose his profit. Thus, it is in his best interest to correct errors in the handling of the ornaments. There are no true byproducts from the manufacture of glass Christmas ornaments, although the ornaments themselves may have originated as byproducts of other types of glass manufacture. Waste is minimal, although there is a considerable amount of breakage. Stems, glass tubing pieces, and broken ornaments can be recycled for use by other types of glass factories. The design and production of glass ornaments for Christmas trees has become a huge industry, thanks to vivid new colors, creative and clever designs, a revival of interest in the uniqueness of hand blown and decorated ornaments, and the explosion of the holiday industry in general. Not only are ornaments prized as family keepsakes and heirlooms, but there are many collectors who seek one-of-a-kind ornaments for year-round display. Designs have gone beyond traditional Christmas themes and encompass other traditions and a considerable variety from endangered species, fictional characters, elaborate treetoppers, and rainbows to AIDS and other awareness ribbons. Other countries with strong glass making traditions and inventive handicrafts have entered the booming market with Czechoslovakia, Russia, and Italy making inroads in this field. Design houses often host receptions where collectors can meet the designers for ornament signings, and limited editions of designers' work guarantee their collectibility and value. With a blending of rich traditions as background and artistic geniuses leading the design front, glass ornaments are at the cutting edge of the holiday business. Foley, Daniel J. The Christmas Tree. Philadelphia: Chilton Company, 1960. The Merriment of Christmas: The Life Book of Christmas. New York: Time Inc., 1963. Rogers, Frances and Alice Beard. 5000 Years of Glass. New York: Frederick A. Stokes Co., 1937. Glitter. Bi-monthly newsletter, Raleigh, North Carolina. Old Europe Creations Ltd. http://www.polish-ornaments.com/ . Rblooms Collector's Corner. http://www.rblooms.com/ . Sacramento Valley Ornament Collectors' http://www.calweb.com/-jtech/pages5.html . I have been trying to find out what the piece that goes down into the top of a christmas ornament and has two wires that spread out inside to enable the ornament to then have a hook attached to it to hang is called. I have many older ornaments from my childhood that need these and can't seem to find them anywhere. Perhaps if I know what they are called I can order them via the internet somewhere.